Lee will sponsor blue jean Friday for $1 tomorrow and again on March 10. Students may wear jeans with a Lee Academy T-shirt or uniform shirt only. Proceeds will benefit Reece's Rainbow & The Griffin Graves Dash for Down Syndrome. Don't forget to bring bottled water for the race! Baseball game today vs. Tunica at home. 4:00 Come out and cheer for your COLTS! Junior Parent meeting today, March 2 at 6:30 in the Library. A phone was found in the gym. Please come to the office and identify. Registration for the 2017-2018 School Year is now open! You must be registered by Friday to avoid the late charge of $100. Please send the the $200 registration fee along with your signed agreement to be sure you are registered. Registration forms are also available in the office. REMEMBER: In order to try out for cheerleader, you must be registered by Friday!! Lee will also sponsor blue jean Friday for $1 on March 3 and March 10. 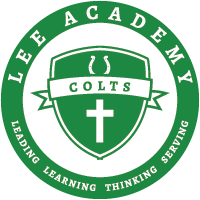 Students may wear jeans with a Lee Academy T-shirt or uniform shirt only.